This post is provided by our “guest blogger” Elke Schüßler. Elke Schüßler is postdoctoral fellow at the Department of Management at Freie Universität Berlin. As part of a larger research program on so-called field configuring events (FCEs) in the German music industry, Leonhard Dobusch and I took a closer look at the question of how the issue of copyright is represented at – and in turn framed by – music festivals, fairs, and conferences where the issue of copyright (or, more generally, the question of the future of the music industry in its multiple forms) is discussed by a diversity of field actors (see working paper). The concept of FCEs comes from organization theory (see Garud 2008 for a scholarly example) and refers to events as temporally and spatially bounded arenas for networking, sensemaking, and debate with a potentially larger impact. We consider such FCEs as a discursive focusing lens hosting different “discourse coalitions” and their respective “story lines” (see Hajer 1993) and argue that the way the event landscape evolves can be taken as a representation of how the field evolves with respect to certain issues. Empirically, we first analyzed at the evolution of the event landscape in the pre- and post-Napster period (1995-2001 and 2001-2009, respectively). We identified 27 events in the German music industry that fulfilled our selection criteria and that we classified as conservationist, reformist, radicalist, or neutral with respect to copyright. We observe a steady rise in the number of events, from only 3 in the year 1997 to 20 in the year 2009 (see Figure 1). There is now a larger number of radicalist and reformist than conservationist events and, accordingly, the majority of newly founded events had either a radicalist (5 events) or a reformist (7 events) orientation. 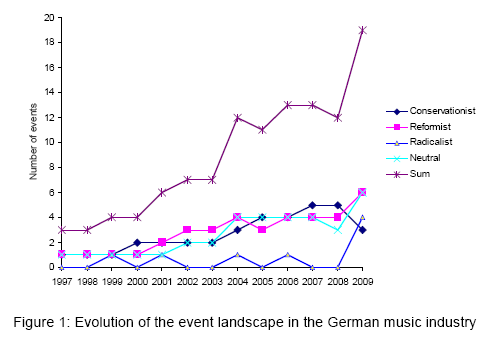 We further conducted a comparative in-depth discourse analysis of three selected events in the year 2009, a critical year for the German music event landscape: the traditional main industry event, the “Popkomm”, sponsored predominantly by the major labels and canceled in 2009 with reference to “illegal downloads”; the all2gethernow (a2n), an impromptu collective act of the independent players in the industry to fill the gap and to counter the claims of the Popkomm; and the c/o pop festival founded in Cologne in 2004 associated with the digital music business. Our aim was to identify compatible and incompatible story lines, associate them with certain actor groups (not) participating at these events, and link them to the related event- and field-level practices. In a comprehensive media analysis we identified 34 different claims with respect to copyright made in the context of these events and, again, classified them as conservationist, reformist, radicalist, or neutral. Interestingly, there is almost a total balance of the overall claims made from the conservationist (42.5%) and the reformist (37.5%) and radicalist (11.3%) positions. The general media discourse regarding the issue of copyright in the context of the events under study can thus be considered as more or less neutral. 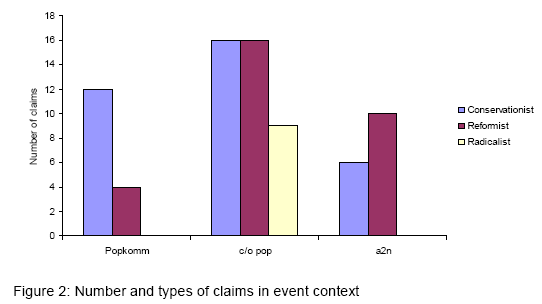 When looking at the kinds of claims made in relation to our three different (non-)events, a much less neutral picture appears (see Figure 2): the most balanced debate was taking place in the context of the c/o pop, with an equal number of conservationist and reformist claims reported and as the only event where also radicalist positions were voiced. In relation to the Popkomm mainly conservationist claims were reported, whereas the a2n was predominantly associated with reformist positions, although the latter exhibits a greater balance between conservationist and reformist positions. When looking at the kinds of claims made by each actor group (see Figure 3), two discourse coalitions can be identified, one at the conservative end of the spectrum consisting of Popkomm-founder and now industry lobbyist Dieter Gorny, authors/artists and their representative organization ADAM, and one at the reformist end consisting mainly of the c/o pop and a2n organizers. Given the almost equal number of claims made by each of these two groups, the actors needed to form a “winning coalition” are those represented in the middle, with the German collecting society GEMA and the labels – interestingly both major and independent – closer to the conservative end of the spectrum and the publishing houses and the media more on the reformist end. These results indicate that indeed each event, at least as represented in the media, hosts a different discourse coalition, i.e. a different core group of actors associated with certain claims and story lines. The events themselves can hereby be considered as a practical manifestation of existing discourse structures and, in turn, as a platform for creating and shaping the field-level discourse. 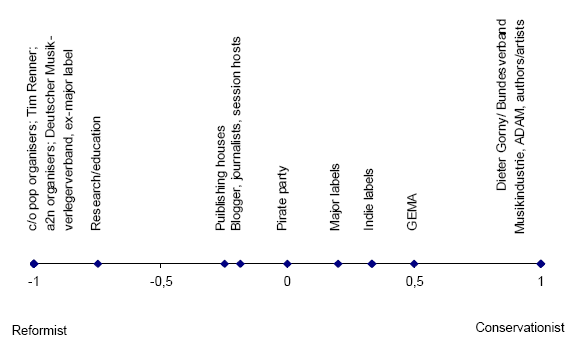 In our case, the existence of two challenger events together with the cancellation of the incumbent event, the Popkomm, has, at least to a large extent, led to the public delegitimization of the formerly dominant conservationist position of lobbying against Internet downloads and for the protection of the existing business model. The new events have helped to bring reformist issues such as alternative licencing, the introduction of a flatrate for music and culture, or the reform of collecting societies onto the public agenda. Quite in contrast to the proposed crisis of the music industry, we can see a striving event landscape. While events holding a conservationist position are indeed stagnating or even disappearing, there is a large number of new events with a reformist agenda, seeking to open up the debate on copyright and to find new solutions and business models. Maybe not in terms of financial revenues, but in terms of activism, debate, and exchange of ideas the industry thus appears healthy and lively. If this can in any way be taken as an indication, then we do not see a cultural decline caused by digital technology, but a steady increase in the role of music for modern culture.